If you want to develop community, a housing co-operative, eco-village, pocket neighbourhood, or cohousing project, come and visit. We can provide you with advice and ideas. We are in central Christchurch, New Zealand. Arrange a personal tour of Peterborough Housing Co-operative as a successful working example. Peterborough is in central Christchurch, New Zealand. Note that Peterborough was extensively damaged in the Earthquake, and will be demolished and completely rebuilt in 2019. We will provide you with a personalised advice session about how to design your housing initiative to development community. A great guide for designing your new neighbourhood for people. Architects' Charles and Kathryn both live in purpose designed neighbourhoods, have visited hundreds, and developed over 50. We chose Charles go provide us with a concept plan for our rebuild. This design guide targets smaller scaled developments of 8 to 15 dwellings. Easy to read design principles. A guide to Intentional Communities in New Zealand. It shows the diverse attempts to build communities. We helped fund its publication to record New Zealand's history. 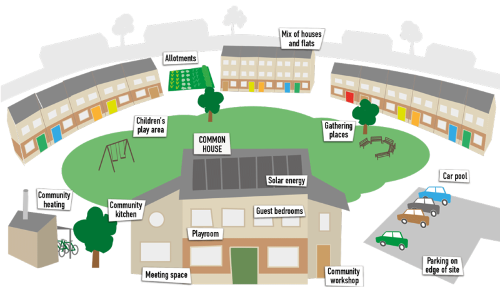 A website showing the different cohousing communities around New Zealand. Cohousing is the latest popular approach to designing for community. The website features Auckland's Earthsong, and Dunedin's High Street cohousing neighbourhoods.